You can expect to be greeted warmly at the front door and welcomed into the lobby. To your left is a place to hang your coat. To your right is the sanctuary where we worship. Ushers there will hand you a worship bulletin and answer any of your questions. Facing the sanctuary, the Fellowship Hall is to your right, through the double doors (if you've come around 9:30am, grab some goodies and coffee). The service is led by the pastor. All the words to songs, the readings from God's Word and the responses (we call this the "liturgy") are in your worship folder and projected on a large screen so everyone can follow along. There will be times for prayer and depending on the service there may also be baptisms, time for silent reflection, or Holy Communion. Don't worry about "getting it right" or "looking new". Many of our worshipers are new and many are visitors like you. If you have little kids, don't worry. We like to hear children in the sanctuary--making a joyful noise to the Lord. Jesus rebuked people who turned children away and said the Kingdom of Heaven was made up of little ones. For extreme circumstances (every family has them!) there is a windowed nursery accessible just outside the sanctuary to your right, where you can worship noiselessly. Hope Lutheran Church is completely handicapped accessible. Parking spaces for both handicapped persons and our guests are located nearest to the front doors. In grateful thanksgiving to God, Hope Lutheran Church was founded in 1972 by our sister congregation, St. John's . 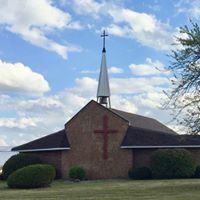 Since then, the people of Hope have stood at the western edge of the city of Adrian, reaching out with Christ's love to the local community and around the world with the heart and hands of Christ. We strive daily to serve individuals and families who long for the refreshment of a life of hope in Jesus Christ, the Savior of the world.